The internet of things (IoT) was sent to make our lives easier, but that has not exactly turned out to be the case. Though manufacturers are churning out IoT connected devices at an even greater pace than before, still most people aren’t aware of the known dangers of using such devices. This has led to DDoS attacks and countless other security issues, despite clear warnings from security experts and the FBI. In today’s families the points of entry can number in the dozens, and each member of the family faces unique challenges to keeping the home network secure. Smart devices can be useful when used properly, and security precautions should be on the top of the wish list. 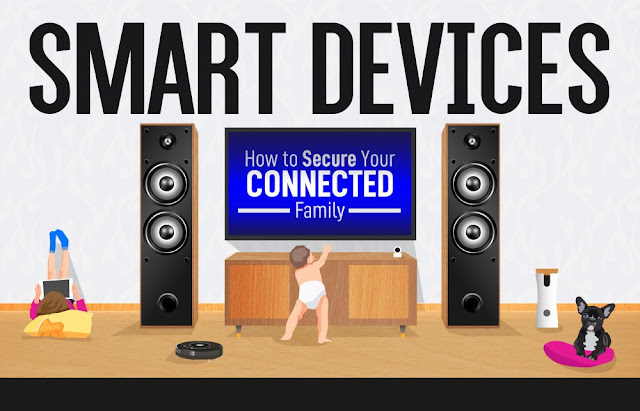 There is no one in the typical connected family who is safe from hackers, not even pets and babies. Internet connected treat dispensers and pet cameras help keep tabs on our furry friends when we are far from home, but they can be used to spy on our families or as points of entry into our home networks. Baby monitors these days usually have WiFi connected cameras, which is great for parents but can be detrimental to home security. Children’s toys can be used to record family conversations, and teenagers have access to smartphones they don’t yet understand how to use properly. Even wearable fitness trackers can compromise your most personal information. But it’s not just the personal devices that are a problem. Many families are opting for surveillance and convenience features in their homes that range from doorbell cameras all the way to connected refrigerators. The appeal of these devices is that you can see if you are out of milk before you leave work and pick some up on the way home, or you can see who is at your door and ask them to go away if you don’t want to let them in without ever opening the door. What’s even more scary is that connected door locks, garage door openers, security cameras, and even robotic vacuum cleaners can be used to gather data about when you come and go, your floor plan, and more in order to make thieves’ criminal pursuits even easier to pull off. It may seem that drastic measures are in order in light of all the ways you may be exposing your family to risk, but a few simple steps can help ensure your family stays safe. It’s important to note first and foremost that manufacturers of these devices are lauding their ease of use over promoting their safe use, but the latter is the most important consideration to make. Whenever possible choose devices that have a clear and proven track record of security. You don’t have to completely give up convenience and gadgets to keep your family safe. Arm yourself with knowledge about the risks and respond appropriately. Learn more about keeping your IoT connected family safe from this infographic!